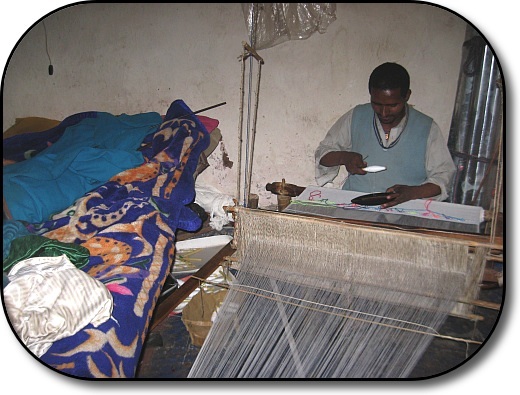 All of the tallits and shawls that are sold on this web site are handwoven by Ethiopian Jews. 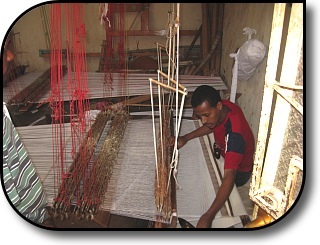 Weaving is a trade that has been passed down for many generations. The weavers pictured here are full time weavers, but a number of people also weave at night in their homes after working all day (most jobs don’t pay enough to live on). They also weave many other items such as dresses, table cloths, bed spreads, curtains etc. We will soon be offering table clothes, bed spreads and scarves on this site. 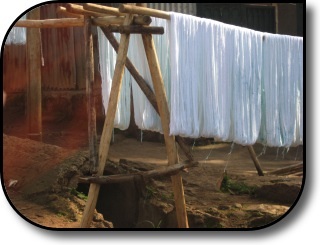 The weaving in this community starts with obtaining cotton as picked from the plant (except for the shawls, which require a specially purchased thread). It is then spun by hand into thread, washed and hung out to dry, and then spun onto spools used to weave with the loom.